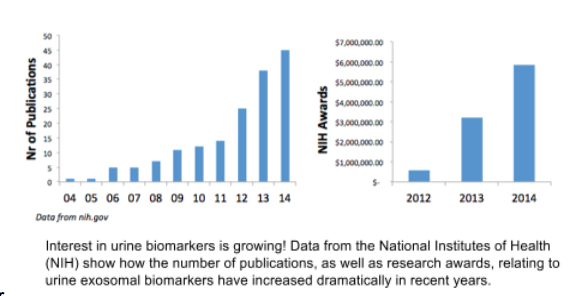 Biomarker research is one of the hottest areas of science right now, and it’s easy to see why: finding quicker and easier ways to diagnose and treat human disease is the ambition of researchers, physicians and patients alike. Tissue and blood samples are now frequently collected during clinical trials for downstream analysis of proteins, nucleic acids, and other molecules that can indicate the presence and/or progression of disease. However, researchers everywhere are starting to look at a less popular biofluid as the next horizon in biomarker discovery: urine. For the Pendergrast brothers of Ymir Genomics, urine biomarker research is a family affair. While proteins have classically been considered the ideal biomarker, microRNAs (miRNAs) are gaining traction as robust indicators of pathology. These small, non-coding RNAs are often misregulated in disease, and changes in their expression patterns can be discerned through microarray or next-generation sequencing techniques. In various biofluids, both proteins and miRNAs are often found complexed with lipids in small, extracellular vesicles knowns as exosomes. These exosomes are shed from cells all over the body, and may be a critical for cell–cell communication. Many studies are now finding that the same exosomes and biomarkers present in blood are also found in urine (J. Mol. Cell Card. 2012 53:668; reviewed in Front. Gen. 2013 4:1). Urine has several advantages over plasma: It can be collected noninvasively (no needles! pain free!) and in large quantities. Urine samples are neither infectious nor considered biohazardous, making disposal much easier. While plasma is generally obtained from a single time point, multiple urine samples can be collected over a period of time, allowing for easier monitoring of time-dependent changes in biomarker levels. Also important, proteins and miRNAs are highly stable in urine for long periods of time (Biomark Med. 2013 7:4). Yet, the issue remains: How do you isolate biomarker-containing exosomes from urine? Many researchers have struggled to answer this question. 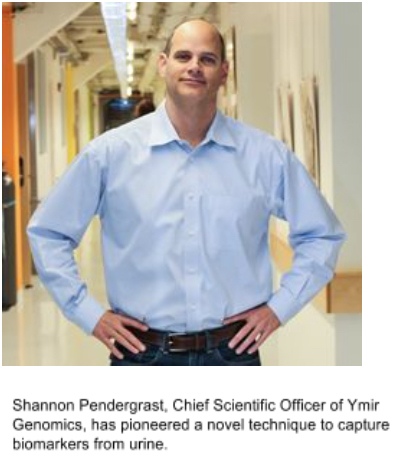 Enter Ymir Genomics. Just over two years ago, Ymir Genomics was founded in Cambridge, MA as a partnership between three brothers with distinct skillsets: Dr. Shannon Pendergrast (Chief Scientific Officer), an accomplished molecular biologist; Scott Pendergrast (Chief Executive Officer), a seasoned business leader; and Stephen Pendergrast (Chief Technology Officer), a software development guru. The company has two goals: 1) provide new tools to facilitate the discovery of biomarkers from biofluids such as blood and urine and 2) use these tools to discover novel urine biomarkers to fight human disease. One of their signature discoveries has been a novel method to isolate intact exosomes from human or animal urine, obtaining both high quality proteins and RNAs for use in biomarker analysis. Their method is significantly cheaper, faster and more robust than existing techniques. Pure, high-quality proteins and nucleic acids can be isolated, even from very dilute samples. These samples can then be used for various proteomic and genomic analyses. Since their start two years ago, Ymir has already been featured in Science, Newsweek, and The Boston Globe. Beyond developing new tools to advance biomarker discovery, Ymir also offers experimental services to researchers, including exosome, miRNA and protein isolation from urine and other biofluids. Additionally, they routinely collaborate with other nearby companies to offer downstream services, such as qPCR or miRNA arrays. To learn more about the services offered by Ymir, contact them directly through their Science Exchange storefront.